Did you have a hope chest? I didn't, but I was clearly at the end of an era. When I graduated from high school in 1961, every graduating woman received a silver teaspoon in a pattern of her choice and a miniature Lane cedar chest from a local merchant. Embroidered pillow case. Flower basket. It was expected that each would marry soon, complete the silver setting and purchase a full size cedar hope chest in which to store her linens. Some did. In preparation for marriage, young women were expected to bring to marriage a hope chest filled with basic homemaking needs. One of these was bed linens. 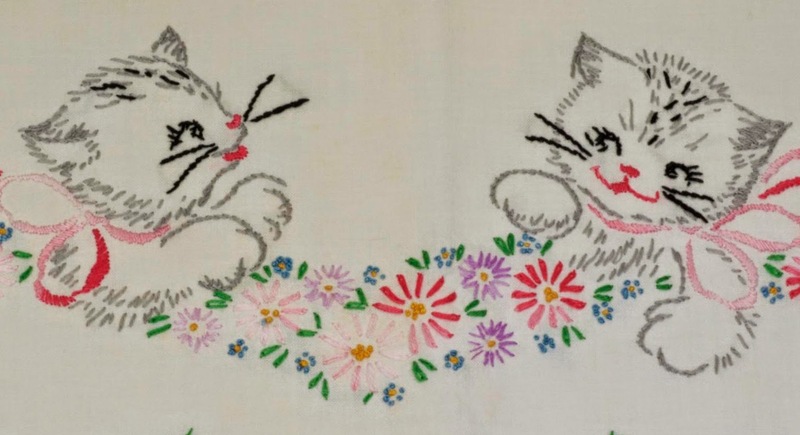 No surprises that kittens were a pattern chosen by a 12-year-old. I didn't really mind working them, but tomboy that I was, embroidering items I never intended to need was definitely not a priority. Let's just say, they languished in drawers, but I did complete two sets of pillowcases because I have them. Both are obviously the work of a neophyte embroiderer. Pillow case, crocheted edge. c.1950. In a giant leap to skilled needlework are my grandmother's worked pillow cases. I have three. Surely they, too, were intended for my hope chest. There are three sets. The hem of the one at right has been cut in a "V" shape with a simple crocheted edging to finish. Pillow case, cut work. c.1950. Another is cutwork, a surface embroidery technique in which sections of the fabric are cut away and the edges reinforced with a simple buttonhole stitch. Although difficult to see in the photo, the design is reminiscent of a southern belle with a broad skirt and flowers flowing from her shoulders. And here is another butterfly! 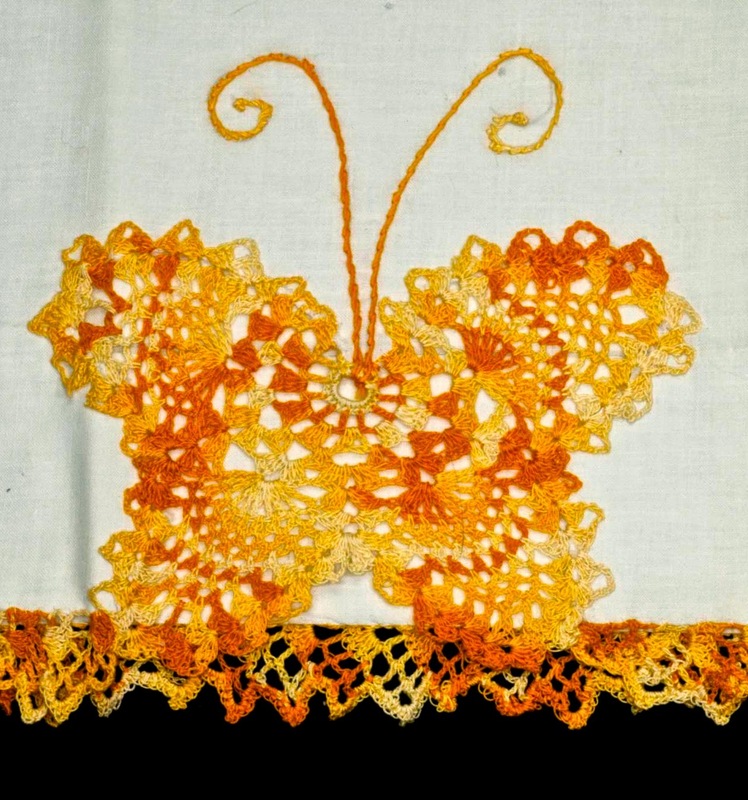 Last week, my blog included a lady's handkerchief with a butterfly motif. This one differs in that the butterfly is sewn onto the pillow case. Its antennae were embroidered on in with a running stitch. It matches the crocheted edging. These very ordinary pillow cases are part of my treasure trove. Of little real value, they are special to me alone. I'm surprised that I have saved them as most--if not all--have never served any useful purpose. And yet, they have traveled with me for many years and over many miles. They are part of me.